Two men have been robbed by teenagers while crossing the bridge in two consecutive weekends, police said. EAST HARLEM — A group of teenagers mugged two men in separate incidents as the victims crossed the Third Avenue Bridge into Harlem River Park — the fourth attack in one month, police said. Investigators said they believe the same group was responsible for all the attacks. The most recent beating happened Sunday at 7:35 p.m. as a man rode his bicycle toward the waterfront park, according to the NYPD. One of the teenagers tackled the 24-year-old man from his bicycle. As he hit the ground the others kicked and punched him while he was down. The group got away with $80 cash, the man's wallet and his blue bicycle. 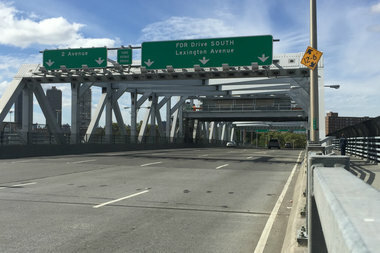 Sunday's assault and robbery came a week after a similar incident on the Third Avenue Bridge in which a group of six teenagers — about 14 and 15 years old — took $50 from a 32-year-old man, police said. One of the boys told the man, "Yo, you got money, empty your pockets." In September, officers received similar reports about teens assaulting men crossing the Third Avenue Bridge. In both of those cases, which also happened during weekends, teens attacked men in their 50s and stole their belongings, according to the NYPD.